Do you write songs? Do you want to write songs? Are you passionate about what’s happening in the world and want to express yourself in song? Well, you’re in for a treat, because one of our finest songwriters, Robb Johnson, is leading a political songwriting workshop in Birmingham. Join him to write your own songs of today. You will develop your songwriting skills during an enjoyable celebration of song in all its diverse and splendid potential, inspiring you to create new songs from your experiences. You will then have the opportunity to sing your songs at Sing Political, a monthly session at the Prince of Wales in Moseley, and submit them for publication in the next edition of the Political Songster. Robb Johnson is a seasoned mischief-maker with a vehemently Left-wing view on the world. His songs are well structured and literate, with a few good gags, and his quizzical delivery suits the genre, reinforcing the notion that the Left still has the best tunes. 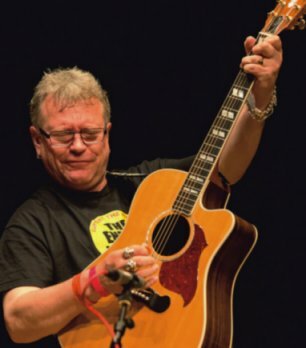 Described by the Daily Telegraph as “one of Britain’s most challenging songwriters”; “one of our best singer-songwriters ever” (Mike Harding), “an English original” (Robin Denselow, the Guardian), “keeps folk music relevant & thought-provoking (The Living Tradition); "there is no songwriter to compare with Robb Johnson operating in the UK" (R2).